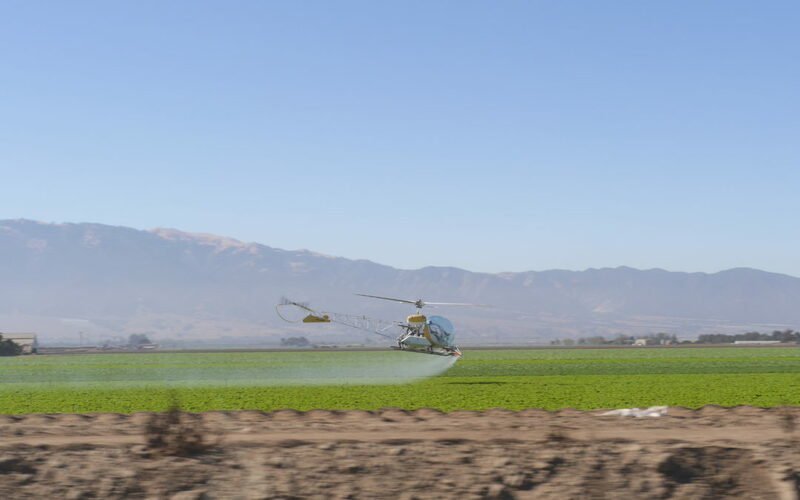 Bakersfield, CA – Six companies were slapped with almost $50,000 in fines for eleven violations related to a pesticide drift incident in August that affected nearly 100 workers in southwest Bakersfield, according to notices served by the Kern County Agricultural Commissioner today. Violations included an aerial application of a California Restricted Material within ¼ mile of a residential area, failure to provide medical care to afflicted workers as required by law, failure to provide 24-hour notice prior to use, and failure to provide respiratory equipment. The incident involved two highly hazardous pesticides: the soil fumigant metam sodium (product: Vapam) and chlorpyrifos (product: Vulcan). Chlorpyrifos, a potent neurotoxin linked to autism, ADHD and IQ loss, has made headlines since March when US EPA Administrator Scott Pruitt reversed a proposed federal ban. Today, the chemical was officially added under Prop. 65 to California’s list of hazardous chemicals. One hundred sixty-seven farmworkers harvesting garlic were exposed to pesticide drift from a nearby application in the August incident. More than ninety workers suffered exposure symptoms from Vapam that included eye and skin irritation, nausea, and headache. Fourteen people were decontaminated at the site, two were transported by ambulance, and two later sought medical attention on their own. The grower, Tasteful Selection, was fined $42,000, less than a tenth of the maximum allowed. According to state law, the fine could have been as high as $5,000 per affected person, which would have amounted to $460,000 for the 92 people involved in this incident. The incident was one of a number of drift incidents since May that sickened farmworkers in Kern, Monterey, Merced and Santa Cruz Counties. On May 5, Vulcan was also involved in the poisoning of a dozen farmworkers in a separate drift incident nearby in Kern. The Center on Race, Poverty & the Environment (CRPE) is a Delano-based environmental justice litigation organization dedicated to helping grassroots groups across the United States with problems related to the disproportionate burden of pollution borne by poor people and people of color. They provide organizing, technical and legal assistance to help community groups stop immediate environmental threats. The UFW Foundation through its service centers is on the frontline of narrowing the gap of information immigrants and farm workers need to successfully navigate American society—whether they seek legal advice, know your rights information, are exposed to pesticides or want to report abuses at work.